I´ve also been asked to hold my first demo next weekend, showing of how to use Shimmerz and Blingz. Thats pretty exciting, and I´m twisting my mind how to showcase them in the best way. I use my Shimmerz all the time, but its a bit different showing others how to use them! I´ve done a few LOs as well, I can´t show all of them just yet, only my take on Julie Bonners March sketch over at the Magpie Club. 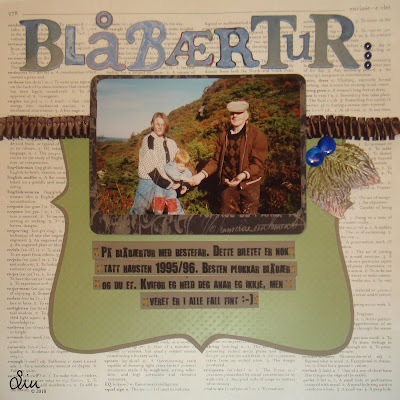 I´m doing a class over at Big Picture Scrapbooking at the moment called Go Hybrid! So, I included the tasks from the first week, which was to use a didi tag and do my journaling/title work on the computer. I don´t do tags that often, so I enlarged the tag provided in the class and used it as a photo mat. 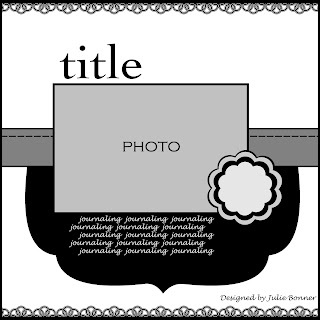 I made journalingstrips in PS as well, and printed it all on my brand new "brown paper packages" paper from Couture Cardstock.